Mayor London Breed likes taking the media out for walks. Fair enough. Speaking for the Fourth Estate in this city, we could use a good walk. Watch where you step, though. These walks are meant, in part, to hallmark the fetid conditions on San Francisco’s streets — and, naturally, the steps our new mayor is taking to clean up this city. When I asked numerous denizens of City Hall what’s driving Breed these days, I received the God’s honest answer: “She talks a lot about poop on the ground.” That sounds a little crazy, but woe to anyone who underestimates our mayor’s smarts and political savvy: She’s crazy like a fox. That’s because this is a subject people care about — and it’s a subject local media is near-monomaniacally obsessed about. To wit: The mayor garnered a front-page story via her announcement that the city would be sending out half a dozen steam-cleaners — whom the city already employs — to proactively clean up feces — which is what they were already cleaning up. That’s a win for a politician who needs to make voters feel better about this city. Hell, maybe those streets will even get cleaned. That’d be a win for everyone. And, from human filth, let’s make the natural transition to Muni, the transit service where, via the miracle of transubstantiation, every spilled liquid becomes urine. Nobody should be allowed to trash our city, and Breed has been proactive when it comes to ensuring voters that she doesn’t condone literal excrement on the footpaths. But what about when our transit service trashes our city by showering figurative excrement upon hundreds of thousands of daily riders? By now, readers of Mission Local — and Muni riders everywhere — may be painfully familiar with this tale. When, on June 25, the Twin Peaks tunnel was closed for a scheduled two-month upgrade, Muni backfilled the curtailed train service by haphazardly siphoning away buses and drivers from other routes across the city. This, predictably, led to massive de-facto service cuts, slam-packed vehicles, and crippling wait times. And, making matters worse, Muni did not inform anyone it was doing this, including the mayor’s office. As such, absent major media coverage, the hundreds of thousands of riders missing work, missing school, missing appointments and muscling their way into crammed vehicles had no idea they were suffering from Muni’s organized kneecapping of its own system. Undoubtedly, many still don’t. Mayor Breed is, per multiple City Hall sources, rather frustrated with all of the above. Average San Franciscans encountering her during her impromptu (Filthy) Streets of San Francisco episodes are now asking her what she’s going to do about it. Mission Local has asked her what she’s going to do about it, too. So far, we’ve heard nothing back. And yet it grows clearer by the hour that Muni can only be fixed if she gives it the horn. 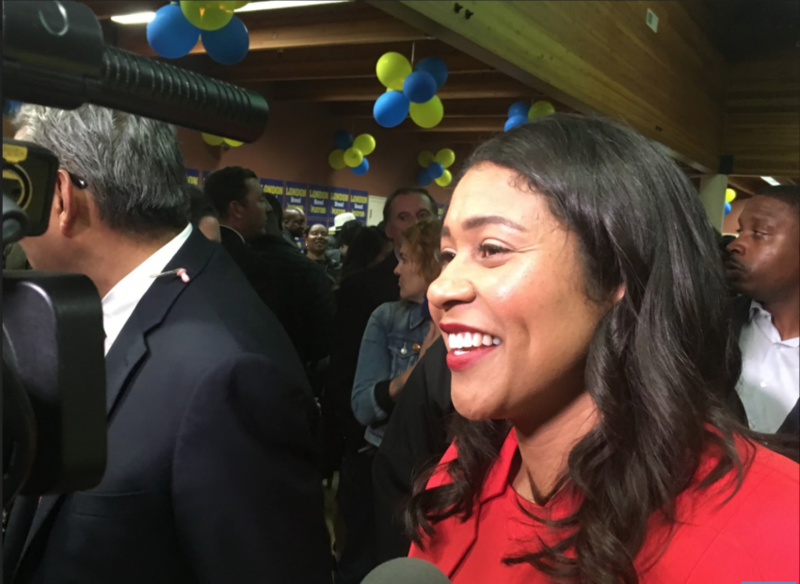 Mayor London Breed didn’t make Muni’s problems, but it’s her problem now. Photo by Mallory Newman. Take a recent story about how, in the midst of a massive transit slowdown, Muni management saw fit to shut down two bus yards during the weekends. We could devote an entire article to explaining why this is a dubious idea and bad for riders, but perhaps the more useful move is to analyze Muni transit director John Haley’s defense of this step. No. 1, it’s a hell of a thing for the agency’s top transit official to punch down against cleaners. No. 2, as a longtime Muni manager put it, “What does it say about the level of leadership here if this administration is unable to supervise and manage car-cleaners and instead closes down a whole division to deal with it?” And, No. 3, don’t you think most Muni riders would rather car cleaners were working more and not less? In fact, Muni officials tell me that, following Friday night revelries, buses routinely arrive back at the yard saturated in puke (and worse). And yet, they’re routinely festering until cleaners get to them on Monday. That’s pretty rancid — and it also means those buses can’t be put into emergency weekend service simply because they’re filthy. But, hey, those car cleaners don’t need to work on weekends anymore. Ricketts’ employer, Shimmick Construction, in its pre-bid questionnaire, claimed it hadn’t been cited for any “serious and willful” safety violations in the past decade. And yet, in 2015, it forked over $67,500 for just such a citation — one of three “serious and willful” violations on its record during the past decade, along with scads of less severe citations. Grand. Muni clearly didn’t do proper due diligence checking on Shimmick’s record — all of which could have been gleaned via a 10-minute Internet search or a 5-minute phone chat with state authorities. But the mayor shouldn’t stop there. Muni now operates on a $1.2 billion annual budget. This is a metric shitload of money. And yet, while Muni is paid like the Yankees, it plays like the Mets. Muni management’s move to hamstring its own service — and, imperiously, do it without telling anyone — simply can’t be allowed to happen without anybody facing any repercussions. So, please, take Muni apart. And put it back together again. But do so in a way that Muni isn’t resistant to common-sense transit innovations that have helped move passengers efficiently in other cities and nations — places that don’t have $1.2 billion to throw at transit service, but, somehow, do have reliable transit service. Do so in a way that the knee-jerk response to any problem isn’t to blame overindulged drivers. Do so in a way that the needs of riders are, at last, the No. 1 priority of a transit agency. 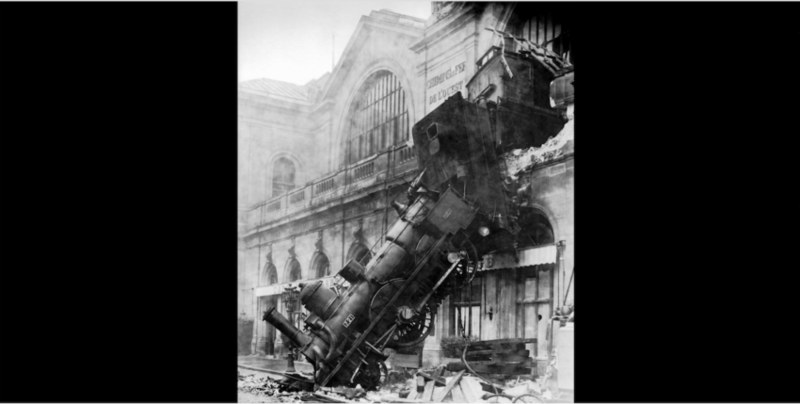 Get a chief executive with enough transit knowledge that she can detect when her managers are undermining her. Conversely, get managers who won’t undermine the executive. Have them sit down with the City Attorney. Perhaps, then, Mayor Breed can lead reporters on bus tours instead of walking tours. Perhaps, then, the buses will come. 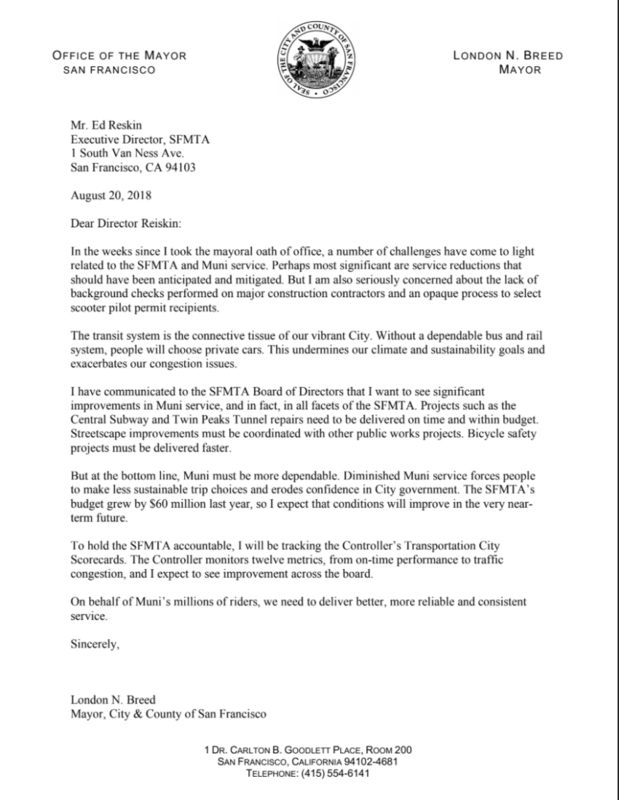 Update, Aug. 20, noon: Today, Mayor London Breed sent Municipal Transportation Agency director Ed Reiskin a letter, attached below, expressing severe doubts about Muni under his watch. Breed cannot unilaterally remove Reiskin from his job; only the MTA board can do that. The mayor, however, appoints every member of the MTA board (and members serve at the pleasure of the mayor). And while the board is, ostensibly, independent, what the mayor desires matters. This letter, City Hall sources confirmed, is somewhat akin to King Henry II purportedly exclaiming “Who will rid me of this troublesome priest?” regarding Archbishop Thomas Becket — in earshot of several knights, who then expediently rid the king of this troublesome priest. This letter reveals Breed’s lack of confidence in Reiskin — and could be read as a less-than-subtle urging of the MTA board to act. Expediently, even. Thanks once again third rail for laying it all out for us. The media has done about all it can to inform the public what the problem is. It is up to the people to take this matter to the political powers that be and demand changes. Joe turned up another tell on MTA last year when he reported that the agency gave a $1.6 million contract to a person whose company was just criminally charged with bid rigging with another San Francisco agency. And what was their explanation at that time? “If a company is convicted of a crime,” Rose added, “we will address those issues at that time.” Just being charge by the feds with being a crook and waiting for a jury to be seated isn’t sufficient reason to cast doubt. For reference, here are the City Performance “Scorecard” measures that Mayor Breed mentioned in her letter https://sfgov.org/scorecards/transportation. Interesting that the only metric MUNI is making is their Crime stat. At the same time, riders give MUNI a “B-” on feeling safe. Perhaps MUNIs goals for reducing crime are set artificially high (easy). It wasn’t intuitive enough, but I linked to this report when you click on “expressing severe doubts.” You’ll note that not only is Muni missing its 98.5 percent service goal, it’s hitting around 56 percent. So, not good. Good, honest reporting. Thank you!